2017 Bayliner 195 Deck Boat Bayliner's family-friendly 195 Deck Boat packs style together with plenty of features for full days on the water. Catch some serious water sports air with fuel-efficient Mercury® power that gets the 195 up on plane fast, even with the maximum crew of 11 onboard. Plush, comfortable seating creates an ideal cruising environment and makes staying out on the water easier. Abundant dry storage keeps gear protected and specialized optional features give you maximum versatility from water sports to fishingfor all the capacity you'll ever need. Key Features Multiple floorplans available: choose standard windscreen or optional wraparound windshield. Innovative portside storage with tote may be replaced with an optional head. 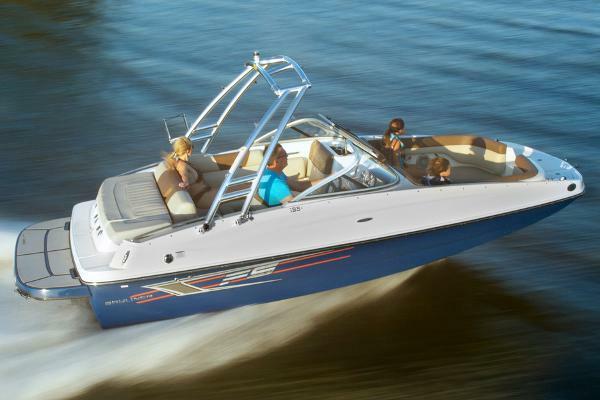 Plush and comfortable seating along with spacious bow makes the 195 Deck Boat great for family cruising. Mercury Sterndrive powers reliable performance, so you can make thrills and memories. 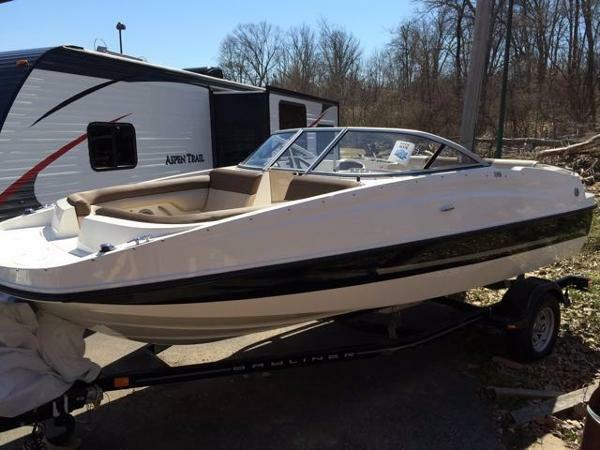 2016 Bayliner 195 Deck Boat 2016 Bayliner 195DB, Mercruiser 4.3L, single axle trailer. 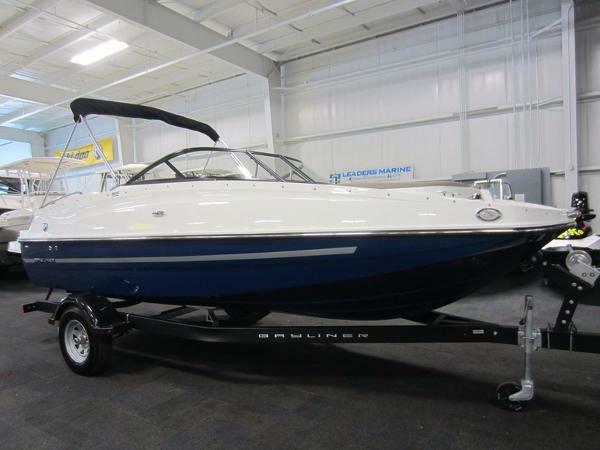 Bayliner's family-friendly 195 Deck Boat packs style together with plenty of features for full days on the water. Catch some serious water sports air with fuel-efficient Mercury® power that gets the 195 up on plane fast, even with the maximum crew of 11 onboard. Plush, comfortable seating creates an ideal cruising environment and makes staying out on the water easier. Abundant dry storage keeps gear protected and specialized optional features give you maximum versatility— from water sports to fishing—for all the capacity you'll ever need. Key FeaturesMultiple floorplans available: choose standard windscreen or optional wraparound windshield.Innovative portside storage with tote may be replaced with an optional head.Plush and comfortable seating along with spacious bow makes the 195 Deck Boat great for family cruising.Mercury Sterndrive powers reliable performance, so you can make thrills and memories. 2017 Bayliner 195 Deck Boat Bayliner's family-friendly 195 Deck Boat packs style together with plenty of features for full days on the water. Catch some serious water sports air with fuel-efficient Mercury® power that gets the 195 up on plane fast, even with the maximum crew of 11 onboard. Plush, comfortable seating creates an ideal cruising environment and makes staying out on the water easier. Abundant dry storage keeps gear protected and specialized optional features give you maximum versatility— from water sports to fishing—for all the capacity you'll ever need. Key FeaturesInnovative portside storage with tote may be replaced with an optional head.Plush and comfortable seating along with spacious bow makes the 195 Deck Boat great for family cruising.Mercury Sterndrive powers reliable performance, so you can make thrills and memories. Upgrades Include: Arctic white with Black Stripe Bimini Top With Boot and Privacy Curtain Bow well & Cockpit Cover Full Windshield With Opening Center Panel Automatic Bilge Pump Boot Stripe Desert Sand Interior Exchange Digital Depth Indicator Stainless Steel Upgrade Swim Platform Extension 220 HP 4.3L Mercruiser Tandem Axle Galvanized Trailer with Brakes Tax, freight, prep and documentation fees not included in sale price. Dealer not responsible for errors. 2016 Bayliner 195 Deck Boat 2016 Bayliner 195 Deck Boat NEW 2016 BAYLINER 195 DECK BOAT! 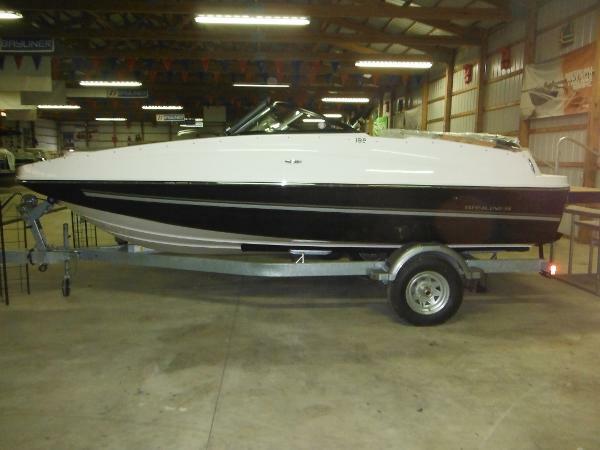 A 220 hp Mercruiser 4.3L MPI (multi-port injected) V6 engine with a 2-year factory warranty powers this loaded fiberglass deckboat. Optional equipment includes: factory bow and cockpit snap-on mooring covers, bimini top w/privacy curtain, stainless steel upgrade package, full walk through windshield, desert sand interior, seagrass snap-in flooring, extended non-slip fiberglass swim platform w/3-step telescoping boarding ladder, and digital depth gauge. Features include: fiberglass helm w/under storage, gauges include; tachometer, speedometer, fuel, oil pressure, engine temp, trim, and voltmeter; Jensen AM/FM bluetooth stereo w/MP3 port, tilt steering wheel, courtesy lights, navigation/anchor lights, electric horn, interior lights, bilge pump, blower, circuit breakers, driver swivel bucket seat w/slider and flip-up bolster, passenger console w/storage, bow swim deck w/3-step telescoping boarding ladder, bow storage w/anchor locker, stainless port and starboard rails, port and starboard bow layback couches w/under seat storage, removable Igloo cooler, stern L-shaped seating w/under storage and removable tote, walk-thru transom w/cooler, fiberglass non-slip floor, in-floor ski/board storage, beverage holders, aft padded sundeck w/flip-up backrest, transom cooler/storage, stainless ski/tow hook, (6) stainless mooring cleats, fire extinguisher, marine cranking battery, 35-gallon fuel tank, 11-person carrying capacity, and limited lifetime hull warranty. Also included is a Karavan bunk trailer including; surge brakes, 15” wheels, swing tongue, LED lighting, tie-down straps, bearing buddies, composite fenders w/steps and swivel jack. Trades will be considered and delivery is available. Competitive financing rates and terms are also available. Approximate payment is $281/mo. for 144 mo. with 20% down (WAC). Leaders RPM is one of the largest marine and powersports dealers in the Midwest with over 70,000 sq ft of showroom, parts, and service under one roof located in Kalamazoo, MI. Price is plus freight, prep, sales tax/fees and is subject to change without notice. All rebates to dealer. 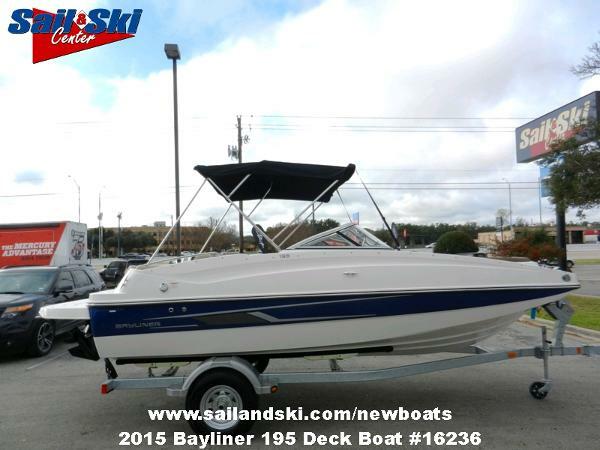 2016 Bayliner 195 Deck Boat Bayliner's family-friendly 195 Deck Boat packs style together with plenty of features for full days on the water. Catch some serious water sports air with fuel-efficient Mercury® power that gets the 195 up on plane fast, even with the maximum crew of 11 onboard. Plush, comfortable seating creates an ideal cruising environment and makes staying out on the water easier. Abundant dry storage keeps gear protected and specialized optional features give you maximum versatility— from water sports to fishing—for all the capacity you'll ever need. Key FeaturesMultiple floorplans available: choose standard windscreen or optional wraparound windshield.Innovative portside storage with tote may be replaced with an optional head.Plush and comfortable seating along with spacious bow makes the 195 Deck Boat great for family cruising.Mercury Sterndrive powers reliable performance, so you can make thrills and memories. 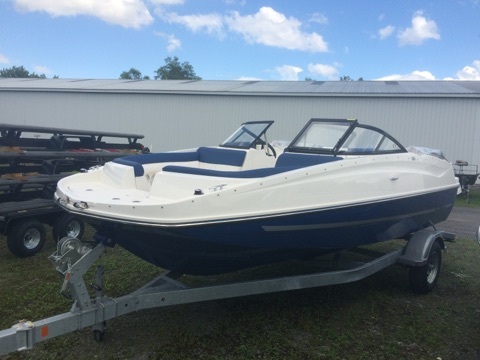 2016 Bayliner 195 Deck Boat JUST ARRIVED!2016 Bayliner 195 Deck Boat 2016 Bayliner 195DB deck boat with Tower and Mercruiser 4.3L MPI 220hp I/O and matching Karavan single axle trailer with brakes and swing tongue. 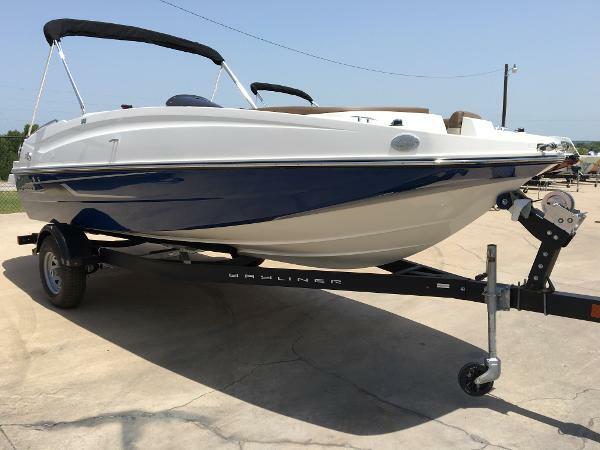 Package includes Xtreme tower with integrated suntop, premium graphics, full windshield, bow filler cushion, snap-on covers, snap-in carpets, padded teak pad swim platform, digital depth finder. 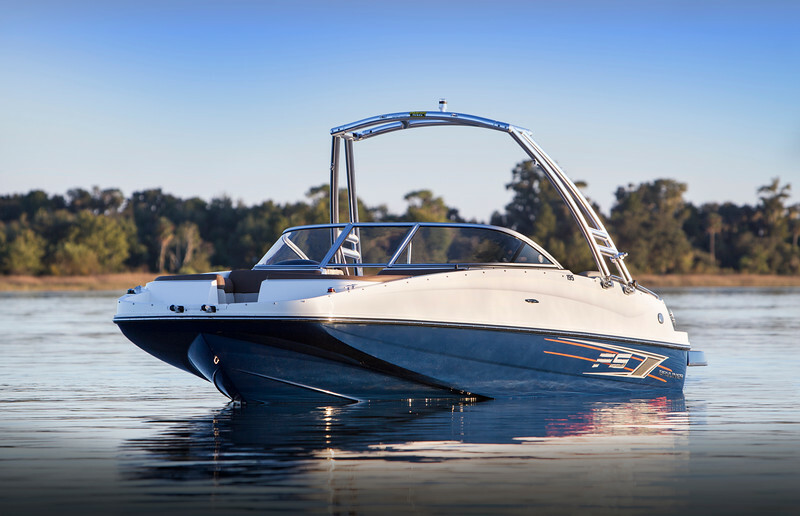 Bayliner's all-new family-friendly 195 Deck Boat is packed with features for full days on the water. Take on some serious watersports air with fuel-efficient Mercury power that gets the 195 up on plane fast, even with the maximum crew of 11 onboard. 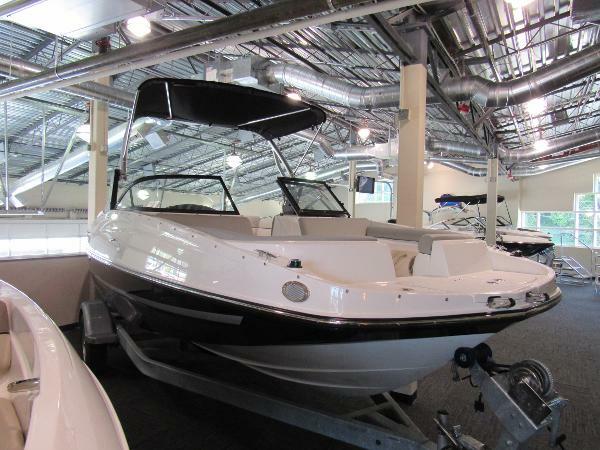 Plush and comfortable seating offers an ideal family cruising environment and makes staying out on the water easier. Plus, multiple available floorplans and special packages make the 195 Deck Boat your boat: select Bayliner's Flight Series or Fish Package to outfit the 195 for exactly what brought you to the water in the first place. 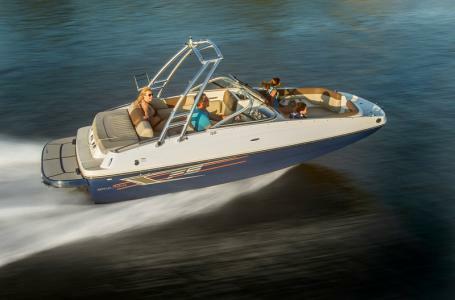 2015 Bayliner 195 Deck Boat Bayliner's all-new family-friendly 195 Deck Boat is packed with features for full days on the water. Take on some serious watersports air with fuel-efficient Mercury power that gets the 195 up on plane fast, even with the maximum crew of 11 onboard. 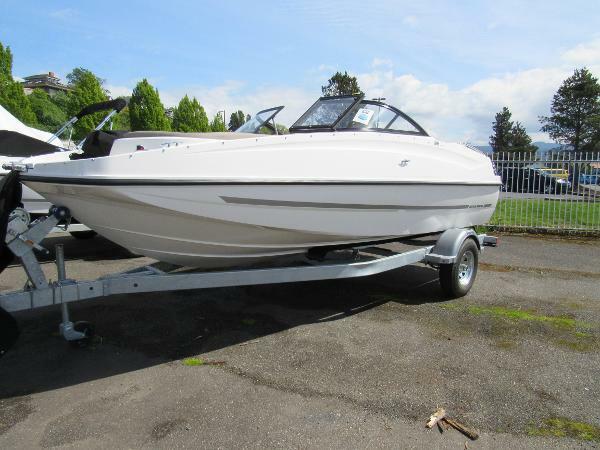 Plush and comfortable seating offers an ideal family cruising environment and makes staying out on the water easier. 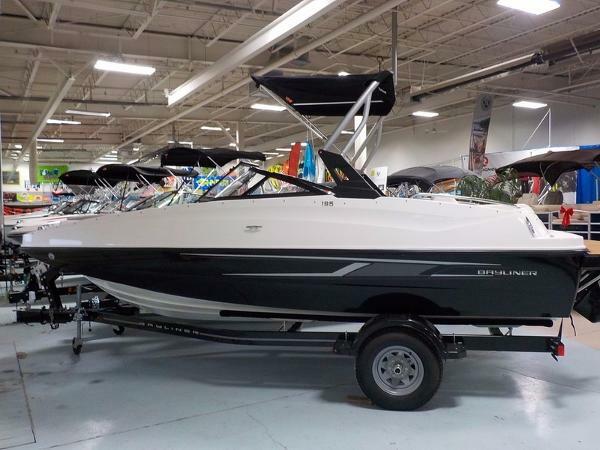 2015 Bayliner 195 Deck Boat, Bayliner's all-new family-friendly 195 Deck Boat is packed with features for full days on the water and now in stock at Lynnhaven Marine in Virginia Beach. Take on some serious watersports air with fuel-efficient Mercury power that gets the 195 up on plane fast, even with the maximum crew of 11 onboard. 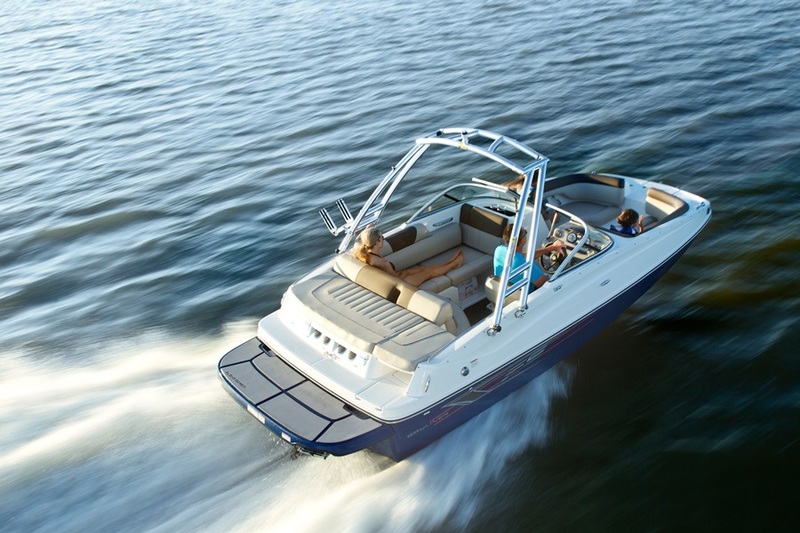 Plush and comfortable seating offers an ideal family cruising environment and makes staying out on the water easier. Plus, multiple available floorplans and special packages make the 195 Deck Boat your boat: select Bayliner's Flight Series or Fish Package to outfit the 195 for exactly what brought you to the water in the first place. Give Lynnhaven Marine a call at 757-481-0700 for complete details and best pricing. Multiple floorplans available: choose standard windscreen or optional wraparound windshield.